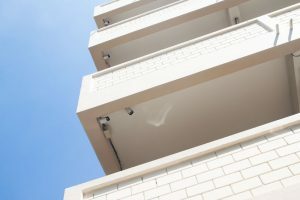 Whether we are talking about families or individuals, people need to feel safe where they live and this is the reason why apartment security cameras are so popular nowadays. When it comes to safety measures, no matter what they are – alarms, video cameras, locks etc. – they all have the main purpose of preventing, discouraging thieves and perpetrators. In other words, an apartment camera system provides peace of mind knowing that your home is secure and monitored 24/7. Security cameras also increase the value of your home. People will be happy to have such a system and most of them are willing to pay more for it, whether the house is only for rent or for selling. Apartment security cameras can also help you avoid liability, if you are a townhome manager. Let your tenants know that you work on a security environment for their own protection and make sure you maintain the system up to date. Statistics show that a security camera alone discourages most trespassers, as well as intrusive or violent behaviors, not to mention that security agents will step into any alert quickly, in real time and collaborate with law enforcement officers to resolve the incident.